The year is 2184, many decades ago nations merged with corporations to form giant mega-conglomerates called MegaCons. Nations were dissolved and the military folded into the company. These elite military and counter-security units have been given the acronym MERCS. They represent the tip of the spear. They are involved in everything from internal MegaCon security to reconnaissance and clandestine operations. MERCS: Recon is a fully cooperative, stand-alone game set in the exciting MERCS world. 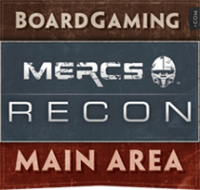 A game of MERCS: Recon can be played in an hour. It moves quickly and is very exciting. Players infiltrate an opposing MegaCon location, fight through crowded hallways, capture and interrogate employees, find important locations, and secure the mission objectives. The office where the game takes place is created using double-sided modular boards. The modular nature of the game board lends itself to dozens of different floor-plans providing a new experience every time. The tight corridors of the office deliver incredible tension. By the time the MERCS get to the end of a mission there is still a lot at stake and the results are very much up in the air. Recon is fully cooperative. No one is forced to play the enemy. The game is designed around simple choices. From the innovative agent movement to the appearance of the oppositional force (OPFOR), players are left wondering what to expect next. The AI is aggressive and MERCS must work as a tight cohesive unit in order to accomplish the objectives. Yet the players can’t turtle and creep, because with each passing moment the office becomes more and more dangerous. 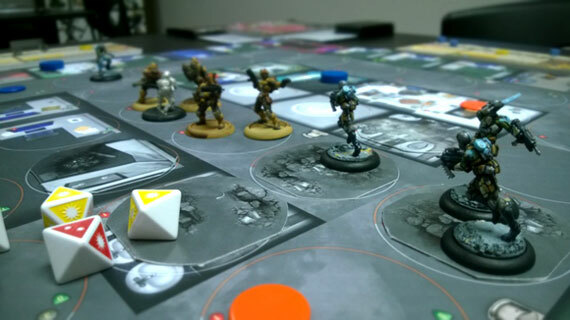 MERCS: Recon offers an exciting, tension-filled game in tight corridors with cool new mechanics and dynamic miniatures. It is easy to setup and highly replayable. From the player’s first steps into the office to the taut finale, each game offers something new and unexpected. 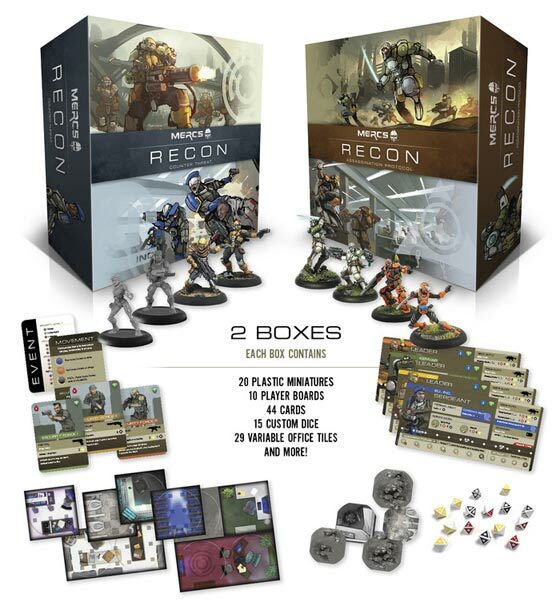 See the expansions in the sidebar to learn more about the core box sets. Add a Review for "MERCS: Recon"